Visiting Washington, D.C. soon? The capital of the United States came to be located on the banks of the Potomac River as the result of a big compromise and some diplomacy displayed by Thomas Jefferson during a dinner at his house (history). Since its humble and swampy beginnings, Washington D.C. has grown into a thriving metropolis replete with historical sites, international cuisine, lots of open spaces, and a national zoo (complete with panda cams). Political dealings are consistently going on, foreign dignitaries could pass you in your hotel lobby, federal agents are everywhere, and the city’s vibe exudes power. With its neo-classical architecture and lower skyline, D.C. has a more sprawling feel than other power cities. While you’re there, you’ll have the chance to visit a host of government buildings; for this piece, I’m going to review the US Capitol, White House, and Department of State. Admission to the Capitol’s Visitor Center is free and no advance pass is needed, but if you want a tour you will need to schedule in advance (or hope that passes are still available for the day that you visit). You can schedule through the Capitol’s online system or through one of your state’s legislators. 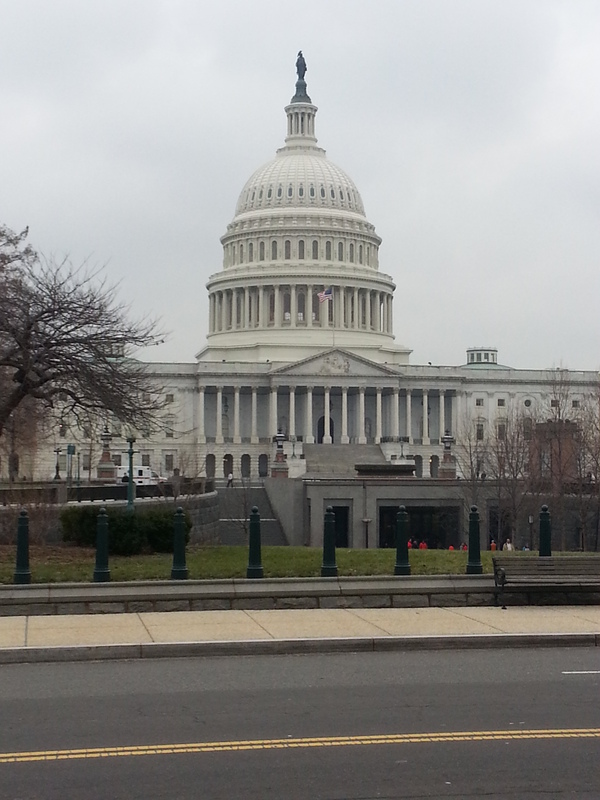 The online system is easy to use and allows you to instantly reserve a time best for you, while a tour through your legislator’s office will afford you a more intimate tour with Congressional staff and you can secure a gallery pass to see Congress in session. I chose to reserve online, because Congress was not going to be in session when I was there. Our guide was engaging, but I was a little jealous of the smaller groups who booked through their legislator’s office. The tour starts with a 13-minute film. At this point, I was very concerned about what I had gotten myself into. I don’t like films much and I abhor being forced to sit through them. I’m glad that I stuck it out though, because what came next was worth the captive cinematic moment. The tour allows you to see the most famed parts of the building. 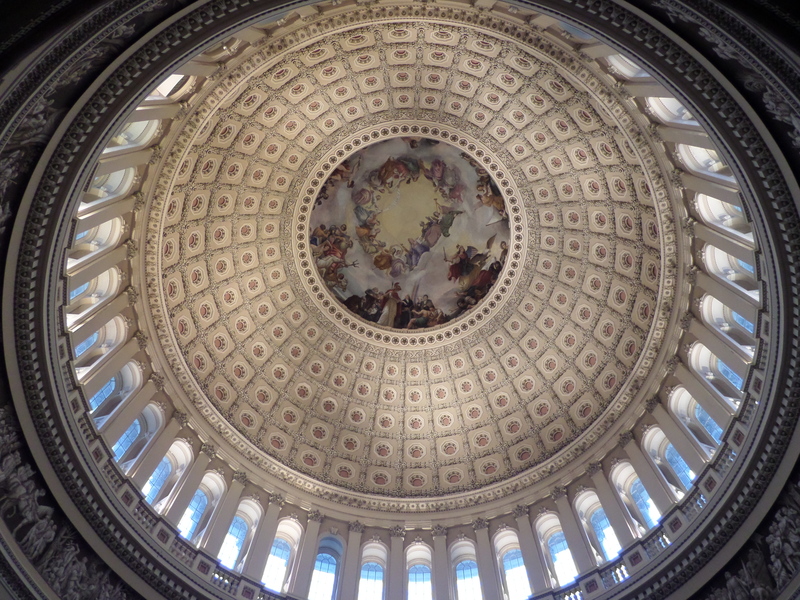 The Rotunda alone was worth sitting through the video. Soaring 180 feet high, the dome is an architectural great with one of the most interesting paintings in D.C.—the Apotheosis of Washington. Constantino Brumidi’s fresco depicts George Washington rising to the heavens as a god or as another “ideal.” He is flanked by maidens that bring to mind the Vestal Virgins of ancient Rome. Surrounding the walls of the Rotunda are truly magnificent paintings, including a couple of my favorites: John Trumball’s Declaration of Independence and John Chapman’s Baptism of Pocahontas. The other six paintings are also visually striking. 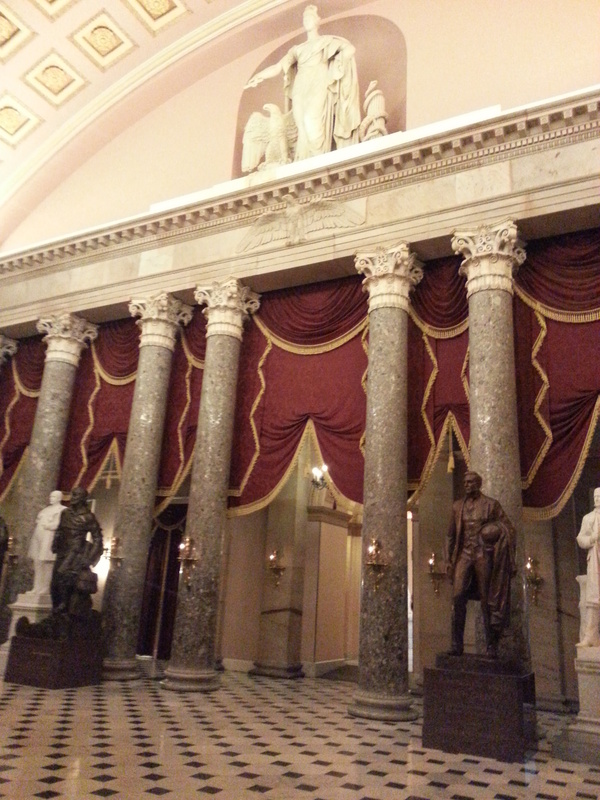 Your tour guide will take you through Statuary Hall, the former Supreme Court Chamber, the former Senate Chamber, the crypt (not nearly as fun as it sounds),and by offices like that of the Speaker of the House. After your tour, you can visit the part that is open to all “Emancipation Hall,” which was named to recognize the nation’s slave past and the use of slave labor to help construct the building. There are some cool historical documents and other treasures in the visitor’s area, as well as the overflow of statues no longer in Statuary Hall. The architecture and artwork on the guided tour were highlights of the visit to me. As it is free, it is well worth the value, but I would have preferred the ability to amble about freely and spend time looking at aspects that are most interesting to me. I have to be honest—I found our presidential mansion a little lackluster. Maybe the build-up was just too much. After applying for a tour through my senator, I waited patiently (somewhat) to hear word if I would be able to get a pass and what day/time my visit would be scheduled. I wanted to book the Capitol tour, schedule a walk through the Department of State’s Diplomatic Reception Rooms, and reserve an admission time for the National Archives. I didn’t want to do any of these things until I had confirmation about the White House. Ultimately, I went ahead and booked everything and lucked out when I received word that my White House tour was approved and that I was scheduled for a time amenable to my other activities. I showed up in the pre-dawn hours on a cold January morning, the wait outside to get in was long. Thankfully, my friend and I were one of the first people in line, but we paid for that privilege by getting there about an hour before our scheduled entry time. The rooms that were open to the public were attractive and there were some skilled paintings, nice Federal-period furniture, and lovely finishings and decorative arts. The overall feeling was—dare I say—humble? My feelings were torn about the interior. On one hand, the lack of ostentiousness befits a republic. On the other, I want my country to put its best foot forward to visitors. Who knows? 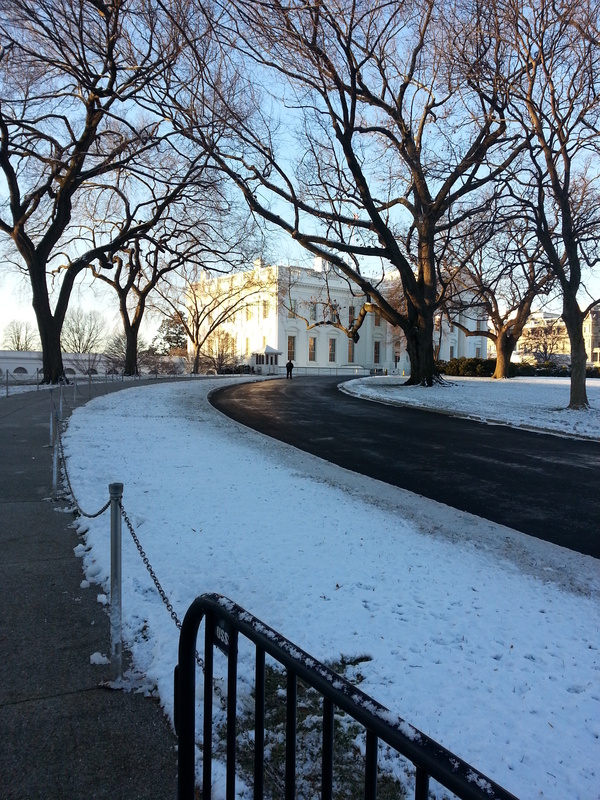 Had I been able to tour the West Wing, or had not waited in the January cold (I’m not a morning person either), I might have felt that the tour was grand. I did like that I could go through at my own pace. I’m not in a hurry to go back though—unless I’m sitting behind a desk in the Oval Office and “Hail to the Chief” plays when I walk in a room. Nonetheless, even though the White House didn’t blow me over, as a historian, it still held great appeal and I appreciate having visited it. 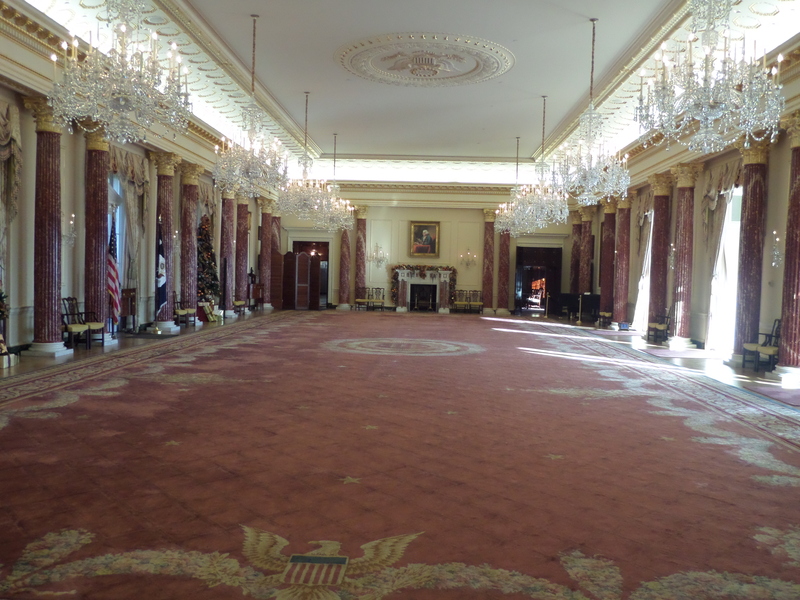 A little known gem is the Department of State’s Diplomatic Reception Rooms. I had booked a tour through the American Historical Organization, but free, 45-minute tours can be reserved here. Pulling up to the building, I had my doubts. We arrived at the back entrance, which had little in the way of architectural charm. The rooms, however, are an aesthetic delight. Filled with fine arts (such as Gilbert Stuart’s famed depiction of George Washington, a portrait of Benjamin Franklin done during in his life in 1758, and Queen Anne and Chippendale furniture), the rooms reflect taste and elegance. The tour is guided, but its short duration and the detail provided made me happy to have a guide. 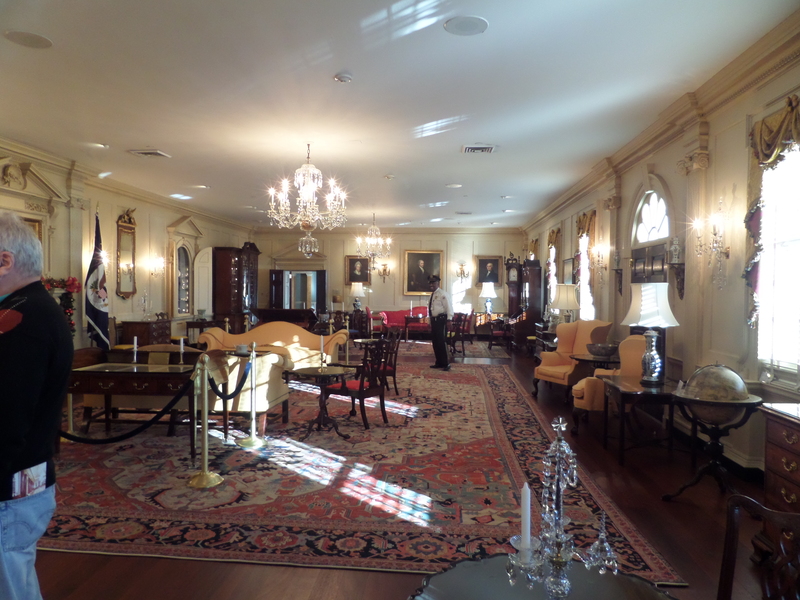 The John Quincy Adams State Drawing Room is where the Secretary of State receives guests; the room is filled with historical treasures—from a table used by Thomas Jefferson when drafting the Declaration of Independence to a desk used to sign the Treaty of Paris (1783) ending the American Revolution. The Benjamin Franklin State Dining Room is the largest of all the rooms and reinforces to those dining within its walls that they are present at the pleasure of the United States of America, as the Great Seal adorns the ceiling and the carpet. All three buildings are functioning workplaces (and one is also a residence), so there is a cool political vibe pulsing as you stroll through. However, one can enter many places in D.C. to see government in action—deals are made over coffee, drinks, dinner, or a jog. If you decide to roam through all or any of these places, let me know what you think. I highly recommend a trip to DC and that you visit at least one of these DC hotspots while you’re there! Previous Previous post: Prof Amy French is now the Roaming Historian! Next Next post: Travelling to the USA? Here are some tips!